Wildflowers have adapted to the Australian climate and flower seasonally in nature. The information below is a summary of the natural flowering times for these species. It is split into seasons (Spring, Summer, Autumn and Winter) with a section for species that naturally occur all year round. 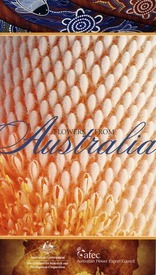 More information is available from WFA in the form of a booklet "Flowers from Australia" with full colour illustrations and a summary of many of the flowers found in Australia. Please contact us here for more details on this attractive publication.